A fantastic start to the term for our Upper Fourth pupils. During Art lessons they are working on Fragmented Portraits using Photomontage technique. This activity is part of their initial explorations in the “About Face” project. 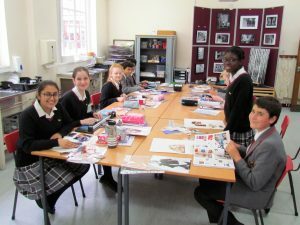 The pupils are exploring how to repurpose and combine existing magazine imagery in new and innovative ways to create their own unique visual representations of a face.